Oh, Canada! 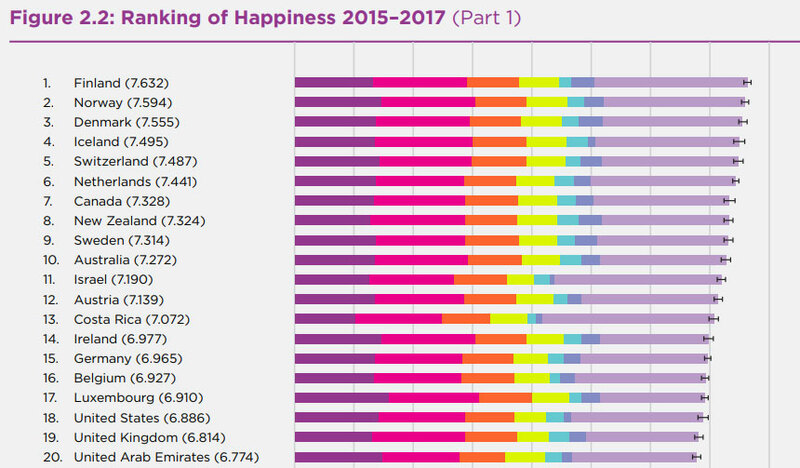 To anyone that has stepped foot in this country, it should not be a shock to realize Canada ranks among the top ten when it comes to happiness. According to the sixth annual World Happiness Report, Canada ranks seventh in terms of nation-wide happiness. In fact, we are the only North American country in the top ten! The World Happiness Report considers a number of factors when compiling their happiness rankings. Factors such as GDP, social support, life expectancy, freedom of choices, generosity, and perceptions of government corruption are all weighed. The majority of the top spots are awarded to Nordic countries, which is in line with past years. Finland, Norway, and Demark are the top three respectively. Our neighbor, the United States did break into the top 20, coming in at number 18 just in front of the UK (19). The report does not just look at overall happiness either; it emphasis is also placed on migration and the levels of foreign-born populations in each country and the impact of these levels. When the impact to happiness as a consequence of immigration is considered in particular, Canda is highly ranked. With immigrants comprising nearly 25% of Canada’s total population, it is comforting to observe high life satisfaction among immigrants in Canda. The report ranked 156 countries in total which adds to the significance of Canada’s seventh-place rank. Canadian citizens should be proud of the wonderful nation they have helped create. From Canada’s lush environment to its diverse people, it is not surprising Canada beat out so many other countries, no wonder so many people want to move here and make a life! The complete World Happiness Report for 2018 may be found here.